Highlights and More from Night One of Spring 2017 Tour! I apologize for the lateness of the blog today (as well as the lack of a question of the day). Wi-fi has not been super cooperative for us as we have been out by the pool most of the day, enjoying drinks and Duran trivia (let the record show that our friend, Lori, and I beat Rhonda and our friend, Suzie!!). Today’s blog is a little vlog that captures the good, the bad and the ugly of last night’s show. Just kidding…it is more about the highlights, lowlights and hopes for tonight’s show. Without further ado, here are our thoughts about last night’s show, the first Duran show of their Spring 2017 Paper Gods Tour. 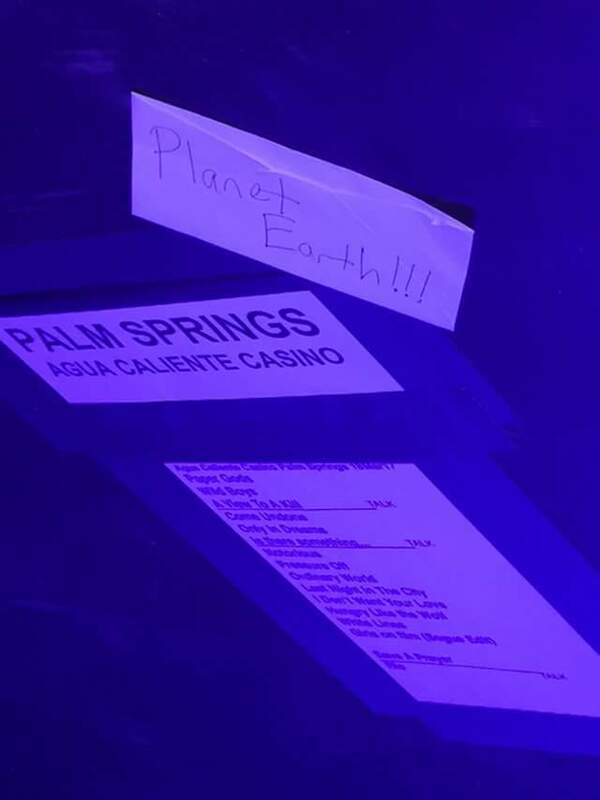 This show took place at the Agua Caliente casino and resort and definitely features some excitement (a new song!!) and some disappointment (have I mentioned that Planet Earth is my favorite Duran song of ALL TIME?!? and it wasn’t played!!!). Twelve years ago today I drove to Chicago to join my new Duranie friends for a weekend of fun and Duran Duran. While I had met many of these new friends months prior in New Orleans, the weekend in 2005 was the first time I would attending a Duran show with any of them. When those Astronaut tour dates were posted, we made plans quickly, including deciding to gather in Chicago to not only see the show, but to buy those more expensive VIP tickets. I purchased those tickets for myself, Rhonda and another friend of ours. In reality, I had no real idea if I could trust them to pay me back, but they did. I had no clue if I could really hang out with them for an entire weekend or whether or not Rhonda and I would share a hotel room without a problem. I took a leap of faith. By 5 am on March 20th, 2005, I knew that it Rhonda and I were able to not only go to shows together but could travel “on tour” well together. During that weekend, I laughed more than I had for an entire year, I swear. I had so much fun that I wondered if it shouldn’t be illegal. I almost questioned my grip on reality because it exceeded every expectation I had. The joy I felt was pure and fulfilled me in a way that I wasn’t even aware that I lacked. To say that the weekend changed my life would be an understatement. Everything changed after that. When I look back at the 12 years that have transpired between then and now, I almost cannot believe it and I certainly wouldn’t have believed it then. Rhonda and I have shared so much. We have traveled to the UK twice together. We have seen shows ranging from Glasgow, Scotland, to Toronto, Canada, to New York City, New York to Biloxi, Mississippi, to Chicago, Illinois, to San Diego, California and more. Beyond those shows, we started this blog here. The Daily Duranie became way more than just a simple, little blog about Duran Duran. It became about fandom and about us and about our fan community. The blog has become a part of us and who are are, both as individuals and as a pair. I think ending the blog would feel like cutting off an arm or at least a finger. I would miss it. Beyond the shows and the blogging, we also organized many fan meet-ups and a weekend long convention. We have written two full manuscripts and have come up with many more ideas. The love that we had and have for a band blossomed, bloomed into real action on our parts. We have criticized widely for our approach, our questioning, our criticism. We have also been praised by our dedication (or insanity). 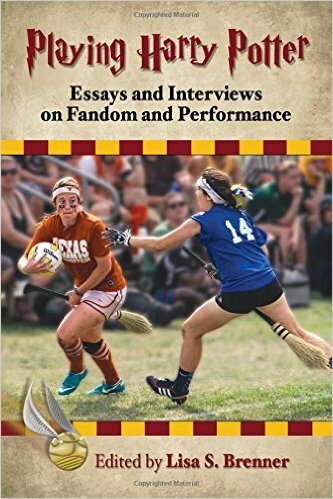 We have been accused of being too negative by some and thanked for keeping the fandom going. Rhonda and I met in New Orleans in September of 2004. While that weekend included some amazingly fun activities as well as an acknowledgement that we were kindred spirits when it comes to Duran Duran, it didn’t create the domino affect like that the weekend in Chicago in March of 2005 did. A convention is a one weekend off event. It is not something that can be easily replicated. Shows, though? They happen more often. Tours provide us the opportunity to relive that first weekend over and over, at least to some extent. That first touring weekend started a snowball of fandom that has grown even as it has changed. It solidified the beginnings of a friendship that has meant the world to me. Now, on the anniversary of that date, I wonder what will come next. Will the snowball of fandom continue to get bigger? Will it stay the same in size while totally changing shape? What about Rhonda and myself? In many ways, our friendship has been tested a lot. We have faced rejection, been ignored, the receivers of some insulting and hateful comments over the years. Beyond that, we recognize that our “real” lives are often pulling us in opposite directions while we continue to work together and to be friends. I don’t know exactly how we will navigate the next twelve years, I just know that I hope we can continue to do it together. After all, we aren’t done with Duran Duran yet. The fun begins TONIGHT: Daily Duranie goes to Agua Caliente! I can barely stand it. I actually am expected to go to work and DO things, all day…be a mom, make dinner, chauffeur a small child to and from her own choir practice, and then go pick up Amanda tonight from the airport. As an aside, I have to tell you, this whole “working” thing all day before collecting my best friend at the airport and having a weekend filled with activities that could likely land us both on the shuttle bus to hell someday? (I’ll save you a seat, Amanda!) FOR THE BIRDS. What I really need is rest. Don’t we all? The trouble, of course, is that even if I had the time to rest up, I’m so excited I can’t! As I teach I’m thinking about what to pack. When I grocery shop, I throw a box of cocktail stirrers into the cart. As I’m driving to go to work, I’m thinking about how long it will take us to get to Rancho Mirage. AND…when I’m listening to Duran Duran, I’m wondering why I haven’t seen any tweets from any band members yet, or what songs they plan to do this weekend, or….whether or not the audience will be showered with confetti. So, have pity for my boss, and my students today. While I’m not a teacher, I am the office lady/campus supervisor/nurse/surrogate mom. I love those kids and would easily lay down my own life to protect any one of them, but secretly (well, not-so-secretly now!) today I’m wondering if we couldn’t just skip the whole “school” thing and go right on to the weekend! That seems reasonable to me! The next time you hear from me, it will likely be on social media. There may or may not be alcohol involved. The band will DEFINITELY be involved, even if not in person at the time! I cannot promise video blogging, but you never know. Stay tuned! Four Days to go till Rancho Mirage! In between sneezes, I am attempting to blog about Rancho Mirage. I think Spring has arrived in California. The outdoor thermometer is forecast to hit 85 degrees (Fahrenheit). Daylight Saving Time means that it is still dark at 6am. Lastly, my allergies indicate that yes, pollen is indeed in the air. Yay. The good news is that it’s Monday. Not that I’m a fan of Mondays, but in this case, I only have four days until Thursday. This is important because Amanda arrives on Thursday, and that is when the fun begins! Rancho Mirage, here we come! My weekend was spent doing the necessary prep work for this trip. Waxing, tweezing, coloring, exfoliating….you get the idea. These things take time! I picked out my wardrobe for the weekend, and today I need to take the time to figure out who needs to go where and when while I am gone. It is a crazy time of year for me to be taking off for a weekend, but I’m doing it anyway. I spent some time trading messages with Amanda and our roomies for the weekend, too, as we made plans for stocking our own personal in-room bar, and deciding how to spend the daylight hours (likely near the bar at the pool). I also downloaded Snapchat, figuring that since Amanda and I would be together this weekend, it might be fun to upload photos there (find us as dailyduranie). I can’t even imagine what might be posted by the end of the weekend! It would appear that all that is left to do is to get through the week ahead. #Duranlive time came upon us so fast, as it usually does, I almost want time to slow down a bit now so that I make sure to enjoy myself. So often I get so focused on the driving from show to show and all of the extraneous stuff needing to happen so that we can get from place to place, I’ll forget to relax and have fun. This time, I really have no excuse. I want to slow down, take a deep breath and savor the time. This really isn’t just about seeing the band, it’s about seeing friends. Sure, I’m looking forward to seeing the band. I have a special place in my heart for John, Simon, Nick and Roger….and of course Dom, Anna and Simon W, too. It’s just that I will spend about 4 hours (give or take) seeing them over the course of the weekend. The rest of the time is for friends. Time will tell for sure, but I think my outlook for weekends like this has changed quite a bit since that first show in Chicago with Amanda back in 2005. I can remember how excited I was to see Duran Duran take the stage. We were in third row, pretty much right in front of John. I can remember when they all came out to the front of the stage, as we heard the loud heart beat begin a rhythm that continued throughout the show. I shook so badly and felt so incredulous that they were really right there in front of me as I stood in third row, I couldn’t even hold my camera straight. Having the band in front of me doesn’t give me quite the same sort of shock it once did (although the excitement is still there!). I can remember the two of us conspiring and planning to find the band. We were positively giddy, and stood outside of the Riverside Theater in Milwaukee just so we could get a glimpse of them leaving. Then raced back to our car so that we could follow them. (Yes, we were those fans and no, I don’t think we caught up to them on the highway…but we tried.) Ridiculous? Absolutely. We laughed the entire way back to Chicago. Now, I’m not saying that I wouldn’t want to see them after the show, but I am saying that I think our days of driving at crazy speeds from Milwaukee back to Chicago might be done. I like living, first of all. Secondly? I’m weird. The last thing I want is for those guys to think I’ve been hanging out somewhere waiting for them all night. Well, unless I’ve been waiting in a GA line for their show. That’s different! I’ve run into one or two of them (never all of them at one time, and some of them I’ve never run into at all) now to decide that the whole scene makes me feel weird, which is why unless they’re staying where I’m staying and it’s serendipitous, I doubt I’m gonna be seeing much of them. While at one point I might have been disappointed, this time, I’m really fine. Yep, I used to obsess about where they might be, and in hindsight, I think I ruined plenty of my own trips that way. Their job is to play a show, and my job is to have fun. Done. That is of course, assuming I can get my work done by Friday so that I can leave this house and head to Rancho Mirage guilt-free, which cannot happen if I don’t get started, so off I go! So, here I am, eight days away from picking Amanda up at LAX, and, like before every other trip or weekend away I’ve taken, I’m beginning to worry that I shouldn’t go. Now, of course, I *am* going – so Amanda doesn’t need to be concerned about that, but I put myself through this torture every single time. I’ve been planning this weekend for a while now, and I carefully set the time aside, saying to myself that I wouldn’t let a single thing get in the way. I should have just started laughing as I thought that to myself, because inevitably, something does. In this case, it’s a few things – and now I have to leave those things to my husband while I go off and have fun. (Truth: I will have fun. Untruth he seems to assume: I won’t think about my family the entire time.) I’m already worried about missing a couple of things and I haven’t even left yet. Sometimes I really wonder why I plan these trips because of the amount of worrying I do before I go. I’ve been majorly stressed out lately. Things are really crazy at work, and things are even more so here at home. My oldest is going through serious heartbreak, my son is waiting for college admissions decisions, my youngest is getting ready for Certificate of Merit testing for piano, amongst quite a few other things. As much as I worry about going, I know that I very much need to go, and this is really normal for me. Just ask Amanda. Speaking of Amanda, I’ve gotten so caught up in work and stuff going on around here that I haven’t even really thought about the things I need to do to get ready for the weekend. I don’t even think Amanda and I have really talked much about the trip at all, which is crazy! Normally by now we’ve carefully planned each minute of each day, and this time, I feel like we’re both just gonna show up and let the weekend unfold however it does. In a lot of ways, as much as it’s really different from what we’ve done in the past, where we’ve obsessed over most details, maybe we both need a little spontaneity. The last six months have been so strange. I went from talking to Amanda nearly every week to talking with her only a few times since August. I don’t check-in nearly as much, although from time to time we still trade texts. Sometimes, I only know what is going on with her from what she writes here on the blog! I feel like I’ve been caught up in a vortex: homeschooling, working, eating, sleeping, cleaning house and repeat, without a lot of anything else. On one hand, it has actually helped my blogging, because I don’t take it all so seriously. I write what I want to write and I don’t think about much else. On the other, I have no idea of what is going on outside of the little bits and pieces I catch in between what’s going on here with me. I’m looking forward to a weekend where I don’t need to think, and I can just sit and gab with friends! In 2005, I flew to Chicago on the 17th of March. I landed at O’Hare around 9 or 10pm, I think, and then took a shuttle to what was then the Doubletree near O’Hare. We called it the “Duranie-dorm” because it was the hotel that had a group rate for Duran Duran fans coming in for their show the following night at what was then called the All-State Arena. I walked in to the lobby and fell into a chorus of hugs and laughter from women that I had previously met in September at the Duran Duran Fan convention in New Orleans. I had never felt so welcomed in my life, and I mean that. I can remember standing there fighting back tears (I rarely cry), because I hadn’t felt that kind of acceptance, friendship or love in a long time. It was St. Patrick’s Day, and while I didn’t really think much about celebrating that night – I stayed up and practically reached for the Sunrise with this group of friends. Amanda was in that group of women that night, and we’ve stayed friends ever since. Twelve years later, and this time, Amanda and I will be arriving at the Agua Caliente resort, ready to see Duran Duran on stage and mingle with friends. There will not be the same group of women waiting for us. Many, if not all of those women, have since moved on. While I think our exuberance for the band isn’t exactly the same now (for example, I’m probably not going to be sporting those same light-up horns I wore in Chicago and Milwaukee at the show in Rancho Mirage), our love for this band and their music is pretty damn strong. Through thick and thin, we’ve managed to be Duran Duran fans, remain great friends, and even write a blog for six years. You want to talk about the strength of women today? How about that?? So, on this International Women’s Day – I am going to think about my friendships with other women, and how together we really are stronger. Yeah, sometimes the road to get to where I need to be is tough. 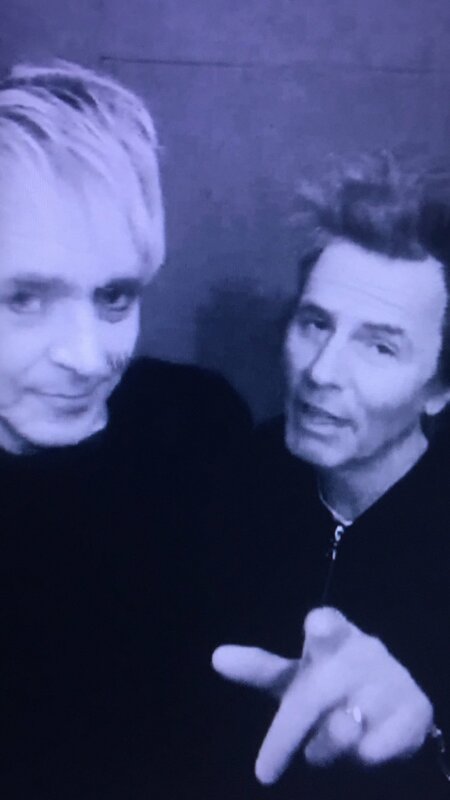 However, I know that I need my friends, now more than ever, and I’m looking forward to revitalizing that bond….and how better than a weekend with Duran Duran?? If Duran Duran had a philosophy of life, I would say that it was to live in the moment. All you need is now, right? In interviews, they often claim not to look back at earlier times. They are happy where they are, doing what they are doing at that moment. During the All You Need Is Now era, I loved the idea of embracing the moment that I found myself in. I felt like this would help me appreciate the good in life and be happier. In theory, I believed I should follow this idea all of the time. Now, in 2017, I cannot help to reject that way of life as much as I don’t want to. Unfortunately, I can’t embrace the now. I am unable, as things are tough and I’m not enjoying myself very much. Thus, I’m longing for the past, for the fun I experienced. Two weeks from today, I’ll be in California. I’ll be with Rhonda and we will be anxiously awaiting the show in Rancho Mirage. The shows there will take place on an anniversary. Twelve years ago on March 17th, I began my very first Duran “tour”. I had seen the band before but that weekend marked the first time I traveled to see the band and the first time I saw more than one show in a weekend with other Duranies. A big part of me wishes that I could go back to March 17, 2005. To say that I had fun that weekend would be an understatement. It was so much fun that I keep going on tour in hopes to have a similar experience all over again! Yet, I cannot go back. There is no time machine and I have no superpowers. It is 2017. I cannot change that. Yet, in two weeks, I will experience another tour, another chance to have serious fun. When I think back to that 2005 tour, I think about all of the little traditions that began then. We consumed a few adult beverages, got very little sleep, and couldn’t find the time to eat meals. Memories, experiences and quotes were captured on paper after I took a take home menu from a restaurant. If those little traditions weren’t enough, more were added with many tours after that. In thinking about this upcoming tour, I could forget about the past and just live right now in 2017. I could also decide to re-embrace those traditions. I’m aware that my touring days are not going to last much longer. In fact, I wouldn’t be surprised if these shows aren’t some of my last. Heck, they could be my last because you just never know. I could go into these shows thinking about how sad it is that touring can’t last forever or that there might be other factors ending my “touring” life. I don’t want that. This little tour needs to be appreciated and loved, especially if it is one of the last tours ever for me. My plan, then, is simple. As I move closer to these shows, I’ll remind myself of all our little traditions to make sure that I follow them. If these shows are some of my last, then, I’ll go out with a bang, even if it means looking back. March is coming, and I’m thankful for the short month of February. I am also very aware that in just a couple of weeks, Duran Duran will be here in California and I’ll be on my way to the Palm Springs area with Amanda. I’m excited to have a girls weekend. Unlike a few of the other Duranies I know, my closest friends in this community live pretty far from me. Even the few that I am friends with here don’t live close by. There’s a couple of people who I’ve been promising to go visit now for a couple of years and I still haven’t made it to see them! I treasure having time to myself where I can focus solely on whatever it is that I want to do, because normal life at home is not quite that way. My trips to see Amanda or go with friends to see Duran Duran are very welcome, and rare. Whether my husband and other family members like it or not, these weekends help keep me sane. It is as much, if not more, about seeing my friends as it is about seeing Duran Duran, something my family doesn’t quite understand or accepts. It’s become the “norm” to tease me relentlessly – whether by suggesting they accompany me (um, no), or my husband reminding me that he never goes anywhere with friends (this is true, even though I’ve otherwise encouraged). He’s gone so far as to suggest that he should get a room at the same place I’m planning to stay even though he’s not going to the show and that way I can stay with him. This kind of thing drives me crazy, because the whole point of the weekend is so that I can hang out with friends, not him. These are people I don’t talk with every day or even reside with in the same country. He sees it as rejecting him, and I see it as spending time with people I rarely see. Why is that bad, and why must I feel guilty for wanting to go? It is annoying that my family thinks that it’s so out of the norm for me to go somewhere without them that they tease, make incorrect assumptions and ridicule. It takes the fun out of going, almost as though I don’t deserve to have time to myself. I don’t know when it started, but it has gotten bad enough to where I’ve begun to reconsider trips like this again. In 2004 when I planned my first Duran Duran convention, my husband really had issues with it. He is very cautious and reserved to begin with, and he wasn’t in love with the idea of his wife going all over the country. I’m sure many of you can imagine the sorts of discussions and negotiations that took place. Over time, he seemed to ease up and not mind the concerts and trips quite as much. Yes, he’d always let me know he wasn’t happy I was going, but it wasn’t so bad. However, our budget is much tighter now, our two oldest kids are either in college or about to start, and I don’t ever get out of the house with the exception for work or chauffeuring duties. If it were up to Walt, we’d never go anywhere or do anything. (He seriously considers our trips to Costco on the weekends as a date and I’m not even joking.) He’s out of practice with the whole idea of my going out with friends, much less going away for an entire 48-hour period and so it’s an issue again. I regularly tell Amanda that I never know when one of our trips will be my last, and that’s the truth. It isn’t just about money, or about my husband of course, which is why I think I appreciate the time so much. I miss talking to my friends and feeling independent, even if it’s just for a few days at a time, which is why I work so hard to make these weekend trips happen. Over the years we’ve written the blog, there have been a few comments that ridicule the money and time we’ve spent, and I get it. Yes, I’ve spent a lot of time on Duran Duran. Yep, I’ve certainly spent a lot of money, too. I guess that the way I look at it is that it’s not just about the band. It is about ME. Sometimes, I feel like I completely lose sight of the person I was before I got married, or became a mom. Unless you’ve been a wife and/or a parent, you probably can’t understand what I mean by that. It isn’t the same as going to a job each day, and it isn’t the same when you’re single – because you don’t have someone else standing there telling you how you should think, feel, or act. Bottom line is that I continue to pay the price because it is worth it. Lately, the blog has been void of truly controversial topics. I have stuck to basics, like commemorating days in history and that sort of thing. The writing has been easy, and I’ve enjoyed not having my inbox/comments flooded with inflammatory and argumentative replies. I don’t miss that sinking feeling in the pit of my stomach, nor do I miss being called out by people on Twitter who really know nothing about me. However, sometimes, no matter how incendiary a topic might be, it is worthy of some discussion. Amanda and I never used to shy away from the tough topics, and I don’t want to start that now just because of my own comfort zone. Over the past few days, I noticed a friend comment about the ticket prices for Duran shows. I replied, commiserating over the cost. On this same thread, another Duranie commented that he didn’t feel the band cared how we felt about their prices. First of all, let’s be clear: I am not all that sure that the band even knows what they charge for concert tickets. As Simon has said many times, they don’t really get involved on the business side – after all, that is why they hire management, right? Second, I would agree that they probably don’t care. I think the band comes out on stage, sees that most of the seats are full – if in fact they can even see that well past the first several rows – and they go about their business of playing their set. They aren’t fixated on how much their shows cost, only what they need to do at the time. Third, Simon himself (and I’m sorry to “pick” on Simon, it just so happens he’s the one who I remember making any mention of this subject) has said that when a fan buys a ticket to their show, they are getting a terrific value for their money. So I think we all know where he stands, and I can’t blame him. As the thread continued, another Duranie friend chimed in. She’s seen them quite a bit over the years, and flat-out refuses to spend so much money to see a band that she’s seen so often. She continued by saying that their latest releases have underwhelmed her, and that also plays a part in her decision not to attend shows. I can’t argue with any of that, either. I mean, why pay to see a band that is putting out music you’re not into? Fair enough. The one question that always seems to come up during these conversations is whether or not the band is really just into it for the money. Now, before you hit the comment button here – I KNOW WHAT THE BAND HAS SAID. John Taylor has said in more than one Katy Kafe that it is not just about the money for them. I KNOW. I would simply ask what do any of us think they’d really say in public?? I highly doubt ANY band would openly say they are still working and performing purely for the money. Even if we don’t think they’re ONLY in it for the cash (which for the record I do not), let’s be fair: making money is part of the deal. It’s called business. Curiously, the answer to that one little question matters to fans. We white knuckle the belief that the band we love really is not about taking us for everything we’ve got and are willing to part with, to see them. Yet I think most of us know in our heads that money has to enter into it all somewhere. The question is, where is that line between having a successful career and selling out purely for cash drawn, and why? Discussion points are continually made that the band isn’t continuing to sell out massively large venues, and that they’re playing Festivals and casinos. No argument there, although I have pointed out in some conversations that this past summer – they definitely came close to selling out at least some of the venues they performed in that while touring with Chic. I’ll admit, in my own personal opinion, the ticket prices were pretty high (considerably so if you bought VIP, which I did). While no, they aren’t playing the same size venues this spring [in the US], the ticket prices have not come down that much. I do see other bands besides Duran Duran on occasion, and while I pay the most to see DD (VIP cost having a lot to do with that so to some degree it is my own fault and I own that), I have found that other tickets are still expensive. It’s just not cheap to go to concerts anymore unless you’re willing to sit in the back or on the lawn. This is not just about priority for fans. The implication that if you really want to see Duran Duran you’ll pay the price and if you’re just a fair-weather fan, you probably won’t and that’s your problem, is distasteful.That belief gives far too much leeway in passing judgment on others. After all, five years ago, I could afford to do whatever show(s) I wanted, and didn’t have to work outside of the home. Now, I can’t, and I work. Things change, and it isn’t just about priorities. There are real fans of the band who have just gotten to the point where they feel as though the ticket prices are too high to see the same basic set list, or to see songs from albums that just have not hit home. In closing, I’ll throw out one more sub topic to mull over. In recent weeks, Amanda and I have had conversations about where the band sits in the overall hierarchy of popularity. The band (DDHQ) markets their success with Paper Gods. I made the comment to Amanda just this past weekend that if one listened to management, it is easy to believe that things have never been better for the band. On the other hand, the energy and buzz have certainly changed over the years we’ve written this blog. It is vastly different now, for a variety of reasons. It is difficult to really grasp the true interest level. On one hand, they can sell out the Hollywood Bowl when touring with Chic. On the other hand, they tend to go for the low hanging fruit and play festivals. They have the opportunity to play for huge crowds without the risk of booking massive venues on their own. They also play a lot of casino shows. More and more often, I read of long time fans decide to sit out shows and tours, saying that they’ve given enough to the band over the years. Is it just the people I follow, or is it a growing trend, and why? Is it our age? Our circumstances? The cost? Are we really that worried about whether the band is only in it for the money these days – or is it just reason to complain? It has come to my attention that you two have been working on a Broadway musical. In fact, based on the most recent Katy Kafe, which took place in January 2017, the first draft of this musical is done. You have finished writing it. Now, you are working on perfecting your ideas by completing a second draft. Obviously, your fans are thrilled to hear of the progress of this exciting project. More than that, we are all anxious to be able to see and hear the musical ourselves in person. Yet, we recognize that the process is lengthy and that there are many steps in between idea to completion. One of the many steps that needs to be completed is to play the musical for a selected audience in order to receive necessary feedback of a project of this size. After all, the intention of the musical is to be actually seen and heard by an audience, by people. You would need to know what people think about it, right? Therefore, I am writing to you to offer Rhonda and myself as your guinea pigs, so to speak. We are putting ourselves out there as a potential focus group. You can then plan to play your musical for us and we would be pleased to provide some feedback, offering both much praise (we are sure!) and any potential suggestions for changes, adjustments, etc. The perfect time for this feedback session to happen would be in March, specifically surrounding the weekend of the shows at Agua Caliente in Rancho Mirage, California as we will all be in the same place at the same time. In fact, my flight will arrive in Los Angeles late on Thursday, March 16th. We could then schedule a listening session for that Friday, March 17th before the show. We would be available all day for such purposes. Of course, during the day on Saturday and Sunday would work as well since my return flight does not take place until Monday morning. In conclusion, both Rhonda and I myself wish you the best of luck in completing that second draft and hope that you will consider our offer to listen and give necessary feedback in order to reach your end goal with the musical successfully. You can reach us here through our social media as well as through our email. We look forward to hearing from you. If you are still reading, hopefully you understand that we don’t really expect this letter to be read or responded to (although we would be open if we did get a response!). I wrote it just for fun. That said, how cool would it be to get to hear this musical while they are in the process of writing it!? !